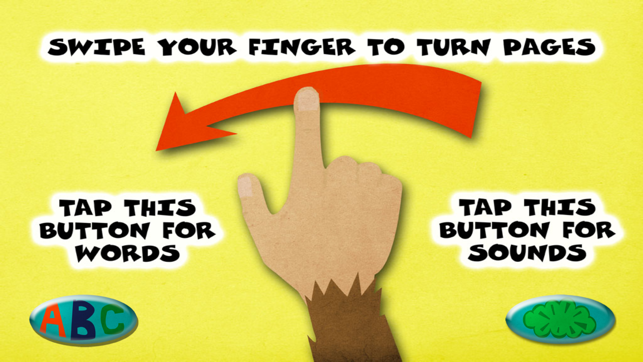 NOTE: To open book "swipe" cover screen right-to-left...don't just tap! "Teach your child the alphabet while they chuckle at the silly sound effects" "AlphaBELCH looks fab"
"We all do it - so let's laugh about it!" 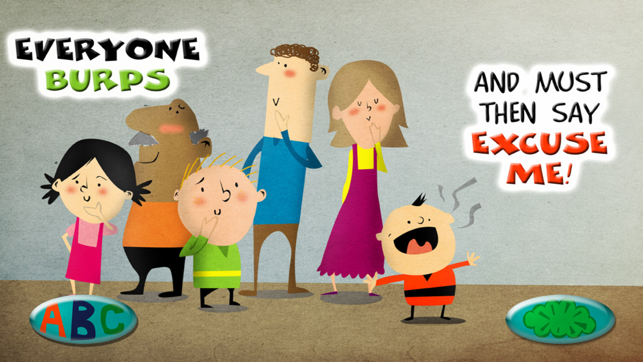 "A great message about manners"
"A fun learning experience that can be enjoyed over and over." 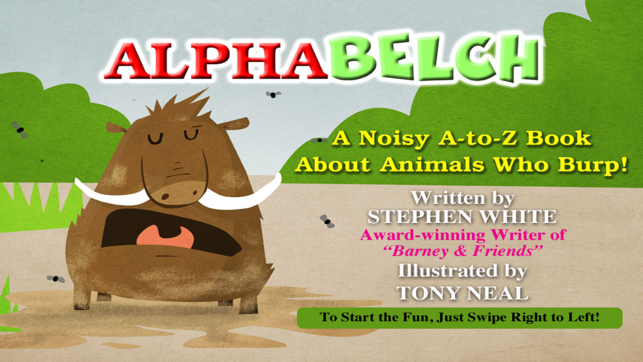 "This app is dead-on funny to kids"
"AlphaBELCH will make a lot of noise in the world of children's ebooks"
Kids love animals and kids love to laugh at burps and belches. Put them together and you've got AlphaBELCH - an A-to-Z gallery of animals who burp on the land, in the air, and under the sea! Writing, narration, and sound design by Stephen White, who has entertained millions of children with "Barney & Friends" television episodes, home videos, feature film, and children's books. 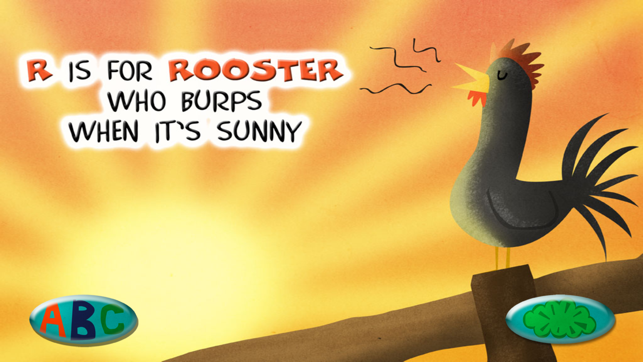 o Funny, full-color illustrations of gassy animals from Aardvarks to Zebras. o Silly sound effects for every animal on every page. 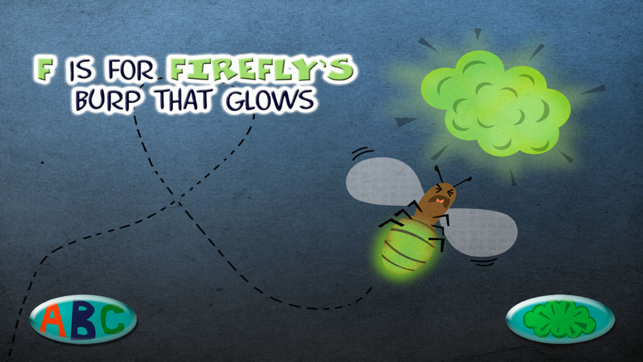 o Spoken narration to help young readers. o Large, easy to recognize alphabet letters. 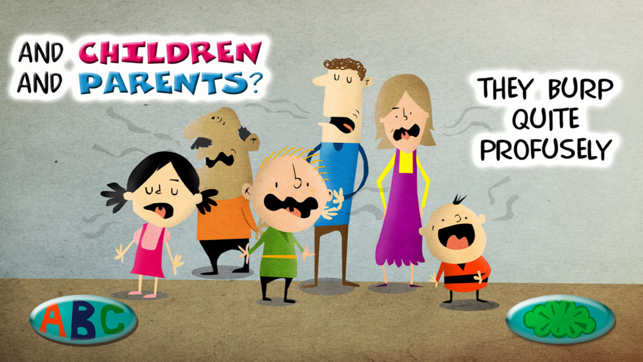 o A wholesome parent-pleasing lesson in good manners, reinforced with fun. o Compatible with iPhone, iPod Touch, and iPad. "Made for Kids" age designation to help parents better match the book app with their young readers. Although I'm older than the target audience for this book, I bought it to have some child friendly apps on my iPod touch. That being said, I've gone through the whole book several times myself and enjoyed it! 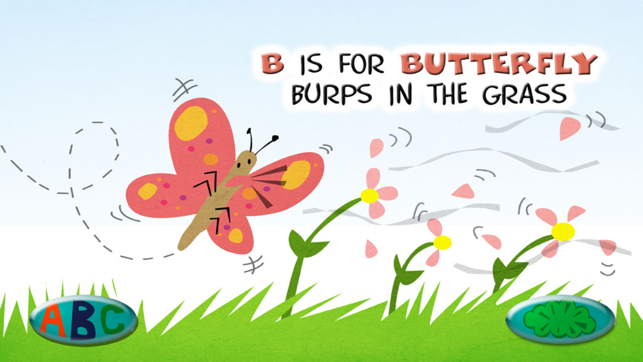 Pushing an "ABC" button on each page activates narration about alphabet letters and animals and pushing a button with a little gas cloud on it activates the sound of burps and a lot more. For instance the bee's burp is set to "Flight of the Bumblebee," and when the porcupine burps you can hear his quills shooting in all directions. The rhymes are funny (reminding me a little of Ogden Nash, who most people are probably too young to remember), and the pictures are worthy of being in a full-size print book. All in all, very well done! My son (and his dad) love the AlphaBelch book. Boys love burps, and this book is funny and has great sound effects. It also has a good lesson at the end about always saying "Excuse me" after you burp. 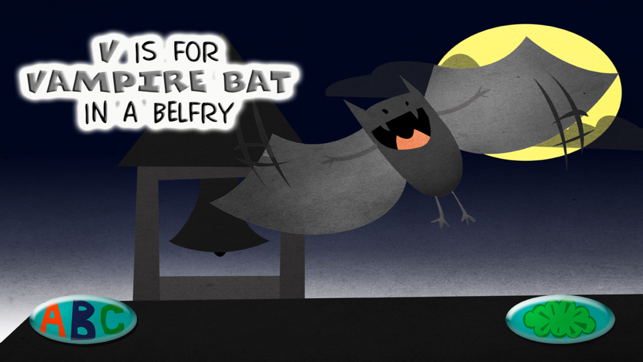 This will have your kids giggling up a storm! So much fun to read with my toddler grandson. Perfect example of how learning and laughter can work beautifully together!